People often learn to do counted cross stitch on aida and later learn to stitch on linen or other evenweaves as they become more experienced. Many stitchers who know how to work on linen prefer it to aida. As always though, this is a matter of personal choice. Some very experienced stitchers prefer aida. 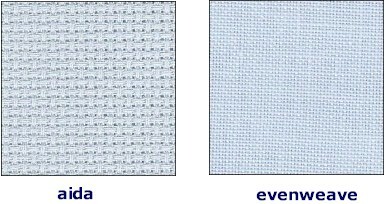 An evenweave is any fabric which has the same number of threads per inch in both the vertical and horizontal directions. The individual threads might not all be the same thickness–you can see this in linen–but the number of threads are the same. Aida is worked with one X over one square, while linen and other evenweaves are generally worked over two threads. This means that a 28 count (28 threads per inch) linen produces the same size picture as a 14 count (14 squares per inch) aida. Most evenweaves aren’t as stiff as most aida. This can be a plus or minus, depending on your own preferences. The difference in stiffness isn’t usually a factor if the fabric is worked in a hoop or on scroll bars. Some people find it easier to see the holes on the aida fabric.. The look of the cloth in the background is also important when selecting a fabric. Both texture and color should be considered. You are going to spend countless hours stitching your next project, so you might consider giving it a unique look by using hand dyed fabrics. Whatever fabric you choose to work on, always buy the best quality you can afford. The amount of time invested in a project can be quite large and is far more valuable than a small savings up front. Also make sure to know the fiber content and if the fabric requires any special care. There are many beautiful hand dyed fabrics on the market that can bring a variety of colors into your design. It is important to make sure the dye is colorfast prior to stitching. Before doing anything wet a piece of white cloth with cold water and gently rub it over each different color in your piece. If there are small areas, use a cotton swab. If there is any color transfer to the white cloth or swab place your piece in the water, being certain that the entire piece gets wet. Gently move the piece around in the water. Allow the piece to remain in the water for about 10 minutes. Next, drain the wash water and fill the sink again with fresh water. Repeat draining and refilling the sink until the water and piece are clear. Do not wring the wet piece. Roll it in a towel and squeeze gently to remove excess water. Place the cross-stitch flat on a dry towel and allow to dry. If the piece needs pressing, place a thick white towel on the ironing board. Put the cross-stitch face down on the towel, place a lightweight white cloth over the back to prevent snagging threads and press on the back.